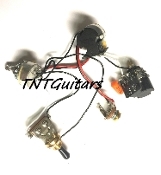 2V1T Prewired 2 Pickup Harness VVT Push-Pull COIL SPLIT/Cut HH / HS / SH ~ 3 Pot / Two Pickup Harness 1 Push-Pull Vol. Pot + 1 Vol. 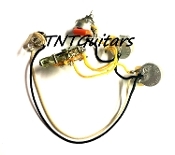 Pot + 1 Tone Pot 3 Way Toggle Switch ~ Mono Jack Pre-Wired Electric Guitar Wiring Harness ..